We’ll be raising funds for In Her Presence, a local organization dedicated to empowering immigrant women from Africa. Click here for more details on the concert. Visit our Partnerships page for information on our thematic focus of racial justice. 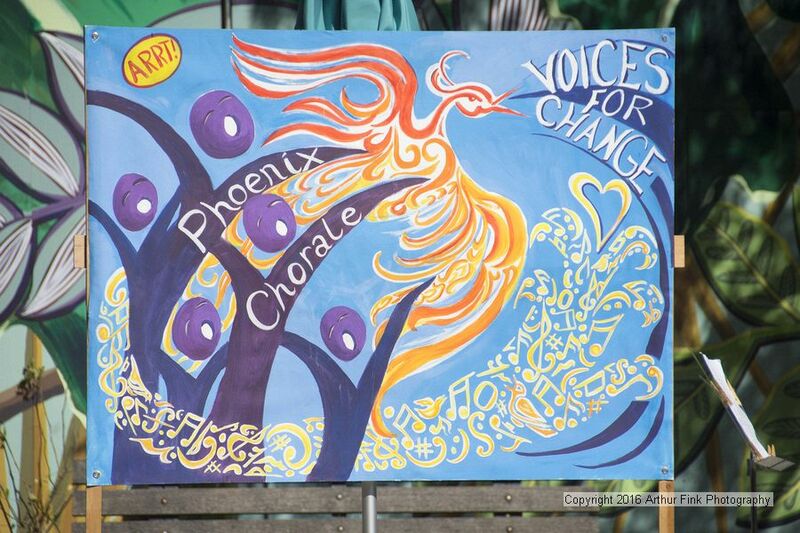 Phoenix Chorale of Portland, Maine is a 501(c)(3) nonprofit group dedicated to spreading awareness of social justice issues and inspiring positive changes in Maine. We formed in the summer of 2014, under the leadership of Dr. Deirdre McClure (click here for her bio). We were honored to host The Concert Across America to End Gun Violence in Portland, Maine, as part of a national day of remembrance and song to honor the victims of gun violence and their families. The concert was held in Congress Square Park on September 25, 2016. For more information, see our concert announcement. 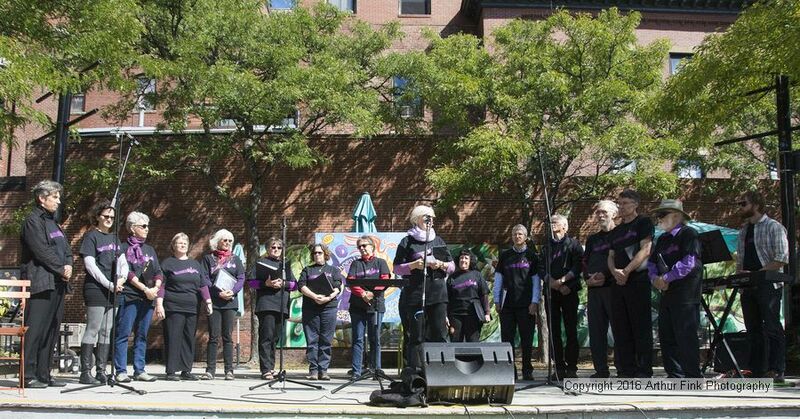 Singing at Concert Across America to End Gun Violence, September 2016. Photo by Arthur Fink. Phoenix Chorale has partnered annually with a local organization to hold concerts, including guest performers and speakers, that highlight our partner’s mission and to help raise donations for their cause. In 2016, we raised funds for ILAP (Immigrant Legal Advocacy Project), and in our inaugural year we partnered with Preble Street, whose goal is to provide accessible barrier-free services that empower people experiencing problems with homelessness, housing, hunger, and poverty. In addition to the annual concert for our partner organization, we also perform mini-concerts throughout the year. In January,2015, we sang at the MLK breakfast in Portland; in November, 2015, we sang at Skillins Greenhouses in Falmouth to raise food and funds for The Good Shepherd Food Bank; and in January, 2016, we sang again at the MLK celebration meal. For the 2017 season, our thematic focus will be racial justice. Visit our Partnerships page for more information. Our unity comes from a deep and abiding love of song that honors the enduring spirit of all people, and from a commitment to helping others.